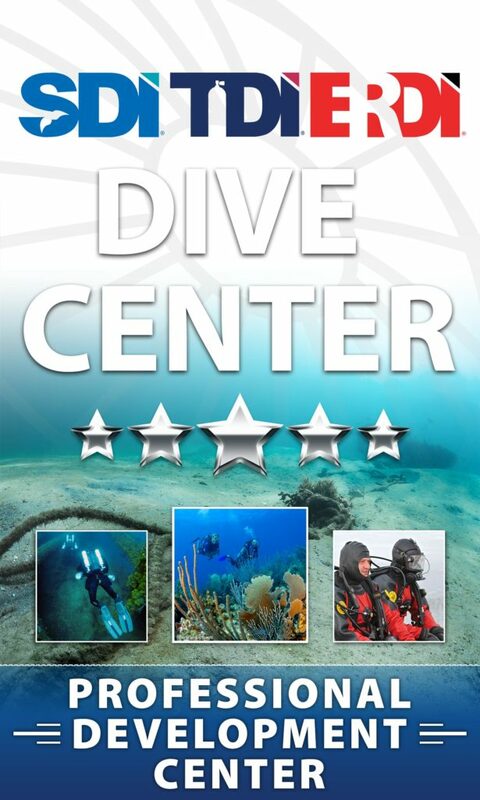 Learn Tech Diving | Cave Diving and More! The Rebreather Zone, based in Dortmund Germany offers high quality rebreather (CCR) training and technical open circuit scuba training. With training available on 9 different brands of rebreathers, look to us for expert ccr training. 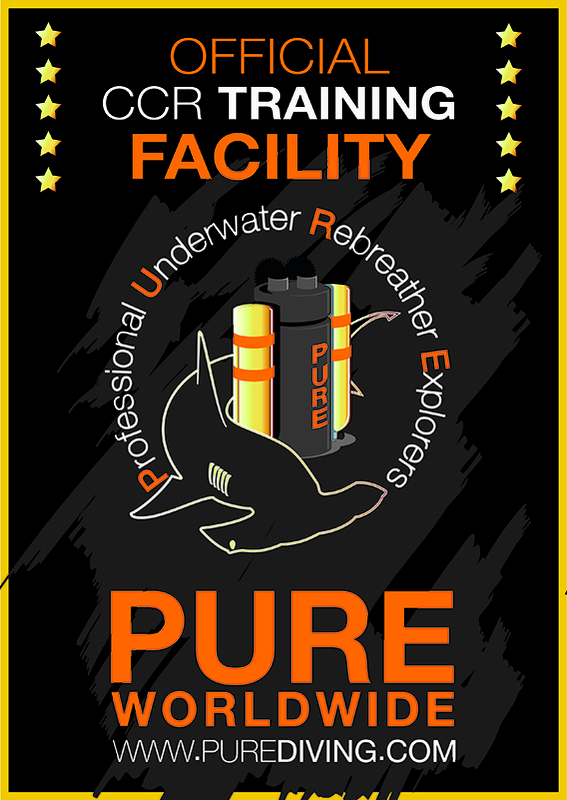 We offer recreational rebreather training, technical ccr training, and ccr cave certifications. In addition to our ccr training, we also teach TDI, IANTD and PADI technical open circuit scuba courses. While we're based in Germany, our training is offered in various other countries including Egypt. We offer diving not only in Nordrhein Westfalen (NRW), but also in other federal states and beyond. 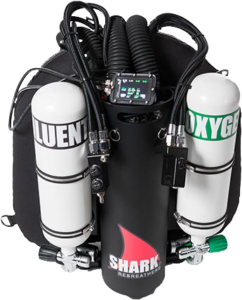 The SHARK REBREATHERS are simple, robust and customizable. Aimed at all levels of diver whether it be technical, beginner or advanced. 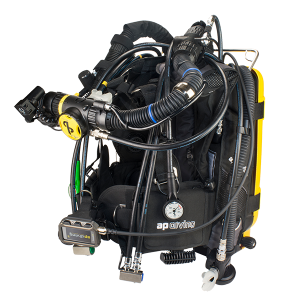 Known for its performance and breathing comfort, the SHARK REBREATHER, is equipped with the latest AV1 electronic controller with HUD backup, separate manual injectors, external gas supply and integrated oxygen mass flow. KISS Rebreathers is located in Fort Smith, Arkansas. They have been building and designing rebreathers since 1995, with the first units being sold in 1999. The company philosophy of keeping it simple is applied to all products designed and built by KISS Rebreathers. The most reliable machines are those that are straightforward, easy to use and easy to repair, regardless of what function they are meant to perform. When designing a machine that is meant to go underwater and that will be used as life support equipment, KISS Rebreathers feels that it is especially important to follow the keep it simple philosophy. 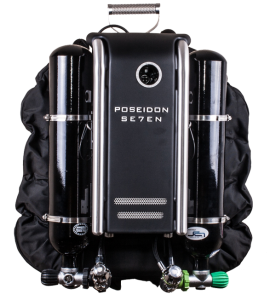 The Pathfinder is an ultra lightweight travel-friendly closed circuit rebreather with ISCan Electronics. 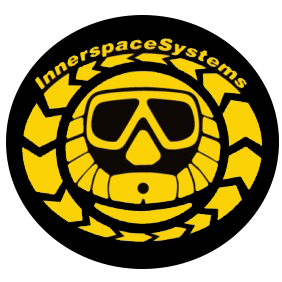 IScan™ is the next generation electronics developed by Innerspace System Corp to power the new Pathfinder rebreather. 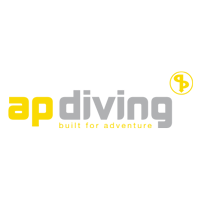 IScan is a Controller Area Network system based upon proven ISO standards used in the automotive aerospace and defense industries IScan is a digital network designed to allow independent devices to communicate and interact with each other. 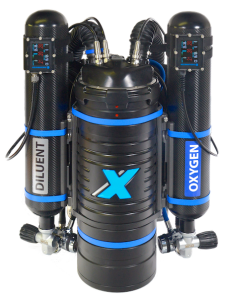 The X-CCR, designed and built by iQsub and distributed by SubGravity, is the latest in cutting edge rebreather technology. 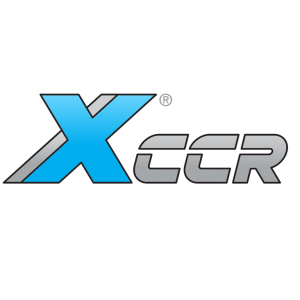 With CO2 monitoring and high-pressure sensors displaying diluent and O2 pressure on the primary handset, the X-CCR sets a new standard for the industry. 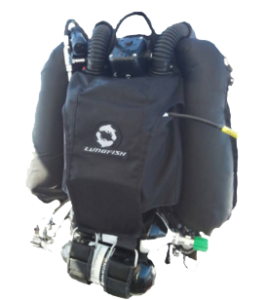 Smaller and lighter than competitive rebreathers, the Lungfish compact rebreather is also lighter and far less awkward than most traditional scuba gear and can be easily configured in a variety of ways to meet any dive (and travel) needs. The JJ-CCR has a robust construction with minimalistic detail work. It gives the diver a versatile rebreather, still very easy to handle as well as to deal with before and after operations. It is a rebreather built by divers and diving engineers. 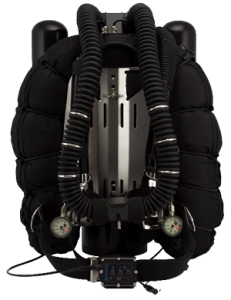 The Inspiration Rebreather started the CCR revolution over 15 years ago and the Inspiration XPD is based on the original spec – the larger unit with a longer duration scrubber and 3 litre cylinders - ideal for deeper, longer duration diving or a series of shorter repeat dives. 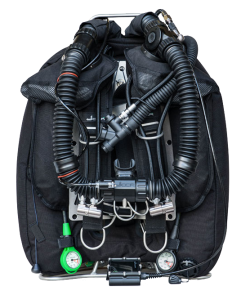 The Inspiration XPD is the expedition divers rebreather of choice. 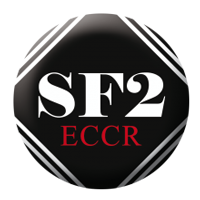 The SF2 Rebreather is a fully Electronic Closed Circuit Rebreather (ECCR) system with manufacturer produced and supported backmount and sidemount versions as well as agency endorsed back and sidemount training programs. The flexibility of having two separate and easily convertible systems reduces planning and equipment considerations for mission specific tasks. 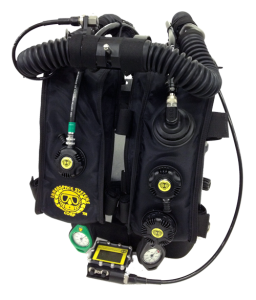 The SF2 Rebreather is produced in Germany and has been available to the European market for some time. The Meg 15 may be integrated with several types of electronic systems, scrubber sizes and types, gas supply cylinders, harness and BC assemblies. The ISC Megalodon 15 CCR or more fondly called “The Meg 15” is a CCR system that has been embraced by divers of all skill levels around the world. 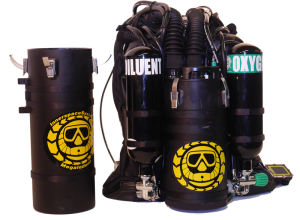 With its versatility of design, it can be configured to meet any level of diving and keep pace with the divers skill levels. 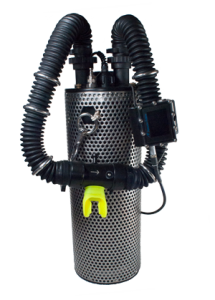 The Meg 15 or Megalodon rebreather from ISC is a great technical diving rebreather, and I offer many courses with this type of unit. The TRITON is a mechanical closed circuit rebreather. 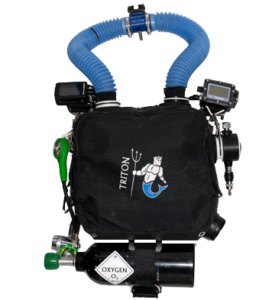 Unlike other rebreathers, The TRITON is chest mount; this allows to be adaptable. The connections developed by M3S on a clip system basis. This enables easy and safe assembly; so much so that the connection will only fit together correctly, this makes it almost impossible to invert connectors (double security system).